Perfection! 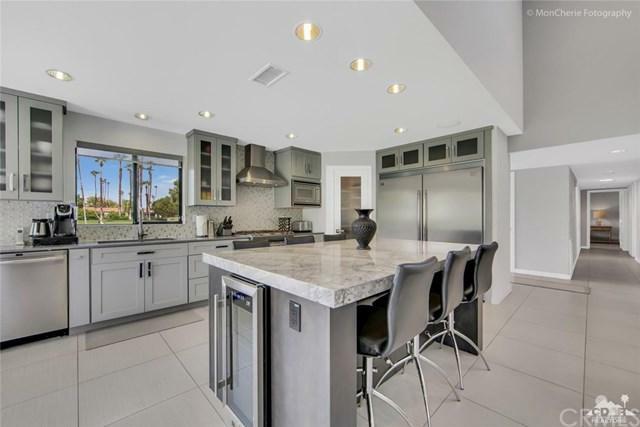 This home has been completely remodeled with the finest attention to detail for today's Buyer. 3 Bedrooms and 2 Baths this home is an end unit 30 Plan. The Kitchen had walls moved to open everything up to the Living area featuring a center island. The Island bar with 6 seats, a wine fridge and granite slab counter tops. Custom kitchen cabinets and top of the line Frigidaire appliances including a Professional Fridge. Beautiful tile work on the back splash. Cozy dining area with windows all around. The Atrium has been converted to a bedroom with skylights bringing in tons of natural light. All the doors and hard ware have been upgraded. Custom double door glass entry welcomes you into this amazing home. Designer furnished and decorated. Conveniently located near the main gate and steps away to one of many pools and spas. Enjoy the walk to clubhouse or The River for theaters, shopping and world class restaurants.